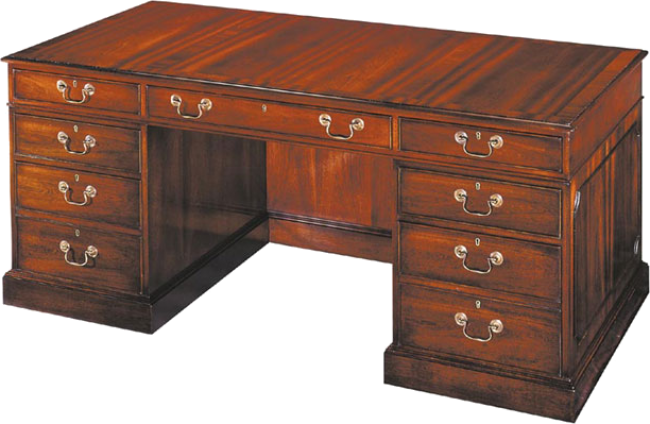 Mahogany double pedestal desk with three section wood top. Desk consists of center drawer, four box drawers and two letter/legal file drawers. File drawers are on Accu-Ride suspension. All drawers lock. Solid antiqued brass hardware. Modesty panel is standard. Raised quarter rail on front and sides. Available with leather top. Pictured in Mahogany.